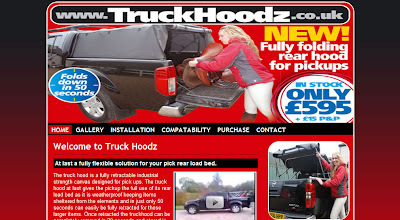 Truck Hoodz, the UK importer of a unique folding rear hood for pickup trucks, launched their new website this week. The Edge developed a small website driven by our Claymore Project Content Management System. This allows Truck Hoodz to update text, images and downloads on demand. It also allows Keywords and other important meta data to be managed and comes with Google Analytics built in. The website features the company branding also developed by The Edge and matches their other marketing materials including leaflets and magazine adverts. The website also provides video examples of the Truck Hood in action via YouTube. You can visit the Truck Hoodz website at www.truckhoodz.co.uk.